Welcome to Fallen Industries Recording Studio & Rehearsal rooms, Wirral, servicing local bands and musicians based in the Liverpool, Merseyside, Cheshire and North Wales areas witha quality. Fallen Industries also provide a wide range of professional music education and training services, including individual & group lessons, workshops and arts award accredited courses which convert into valuable UCAS university entry points. To discuss specific requirements please call 0151 678 5304 or send a message now. 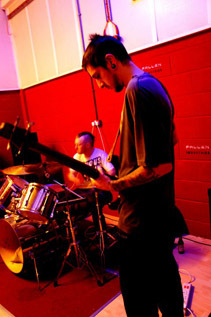 Each studio is professionally soundproofed and acoustically treated meaning you wont be disturbed by your neighbours and can play as loud as you like. Minimum booking is for 2 Hours, including setup.